Archive for the ‘drift dive’ Category. Notes: Double boat dive with Scubamunkies at Mona Vale near Palm Beach in Sydney. Price: $110 pp. tanks and weights only. 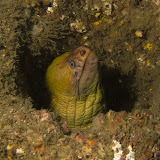 Diving: The Valiant was nice: lots of Moray eels. With the boat moored neatly at one end, it’s a very easy site to navigate. On the second dive I was unbearably cold, shivering even as I finished descending, and yet the water temperature was warmer according to my computer. I wonder if on the first dive some cooling effect happens from which you don’t fully recover, so that the second dive feels colder? I consistently find the second dive colder than the first, regardless of the measured temperature. Camera notes: My camera rig has a few too many cable ties and bits of blu-tac keeping it together. It is time to invest in the proper INON fittings to attach the Canon DC-38 case to the INON D4 grip.